Summary Great bike for downhill biking. 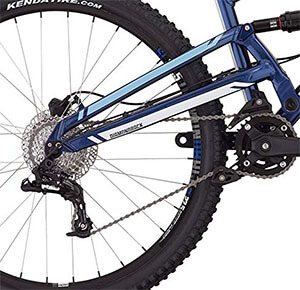 Are you finding a mountain bike that features an incredible suspension system that makes off-roading a pleasure? The Diamondback Atroz 3 has an astoundingly effective suspension system that makes riding in mountainous terrains a pure joy. The experience is enhanced by the number of gears available, wheel size, and frame design. If you’re interested in riding smoothly up and down hills, you’ll be very interested in learning more about the DB Atroz. We’ve extensively reviewed this bike and included everything you need to know about it in our review below. You’ll have a better idea of what this bike can offer you and whether it’s the right pick for you. Simply have a quick read below to find out for yourself. Who Should You Buy & Suggested Sizing? This bike was created as an entry-level option for complete newbies who are looking to get into mountain biking. If you’re planning to ride across challenging terrains, you’ll appreciate how this bike is built to help you get through them with speed and precision. People who are looking for a high-quality bike on a budget will be overwhelmed with the number of fantastic riding features that the Atroz has to offer. We instantly noticed that the size of wheels that you can attach to this bike make it awesome for mountain biking. The tires wheels are 27.5” in size. This is a fantastic size that enables you to ride across the rockiest terrains smoothly. They are incredibly effective at providing you with a lot of traction. This is a beneficial when it comes to riding on surfaces that have loose gravel. Many people often skid out while riding on gravel, but that isn’t something you need to worry about with this bike. Furthermore, the traction on these tires makes it a lot easier for you to build up momentum and speed. While carrying out our research, we realized that the effort Diamondback has gone through to ensure such a high-quality frame is remarkable. The Hand-built 4-inch travel full-suspension frame has been created using aluminum materials, and they provide numerous benefits. For one, they make sure that the entire bike remains very durable. This is a huge plus for mountain bikes as it’s likely that you’ll be riding it in harsher conditions. Moreover, we appreciated how the frame also provides you with a fantastic element of comfort too. Therefore, you can enjoy your rides across tough terrain more as you feel entirely comfortable. When you consider how affordable this bike is, you would expect it to come with a pretty standard suspension system. 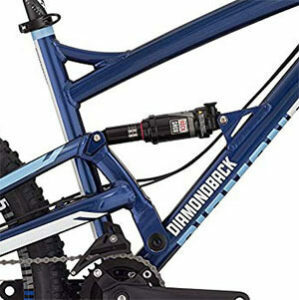 However, Diamondback has taken the suspension mechanisms of this bike to another level. They have incorporated a Rock Shox Monarch R, Air Shock dual suspension system, which is pretty much unheard of across bikes within this price range. This feature means that you can ride across all kinds of tricky terrain, without feeling the impact as much. The suspension works to absorb a huge brunt of the shock. This adds another aspect of comfort to your ride. Furthermore, it means that you won’t become fatigued as quickly. So, you can experience longer rides with more enjoyment. At first glance, you can tell that the design of the Diamndback Atroz is beautiful. It manages to somehow bring together a classy and sporty visual aesthetic into one package. One of the main contributors to the excellent design is the way that the frame has been positioned. 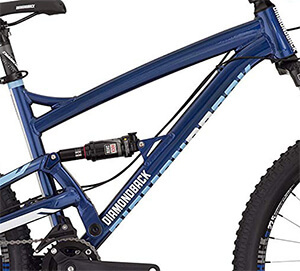 We liked how Diamondback has manufactured a bike that combines a sporty and classic look that will please mountain bikers everywhere. The amount of speed that you can experience while riding any bike is always a massive draw. So, how fast is the Atroz bike? We were glad to find that this bike provides you with the ability to travel at very high speeds. This is a direct result of the gear mechanism that they’ve used with this bike. There is an SRAM NX 11 speed drivetrain fitted. As a result, you can feel confident in knowing that you have the best gear options available to help you get the most out of this bike. The wide selection of gears that are on offer to use also allow you to ride up and down steep hills with ease. You can simply select the most appropriate gear for your situation, and the bike will help you travel up or down inclines with complete control. Customers have appreciated the speediness of this bike. It enables you to challenge yourself more on off-road terrain. Now that you know you can reach high speeds with this bike, you may be concerned as to what the braking systems are like. Well, we found them to be astoundingly effective. 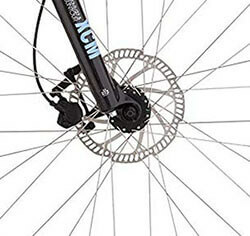 The Atroz mountain bike incorporates with Shimano M315 hydraulic disc brakes. They are incredibly powerful and provide you with all the stopping power you need to ride safely. We liked how these brakes have proven themselves to be very effective in all weather conditions and terrains. They feel effortless to use and enable you to have full control over your speed. This is the case whether your traveling at a steady pace, or at higher speeds. Since this is an entry-level mountain bike, you may not realize how great the price is. Many bikes that come with some of the same features as this one is above the $2,000 price range. Surprisingly, the Atroz is available for under $1,500! 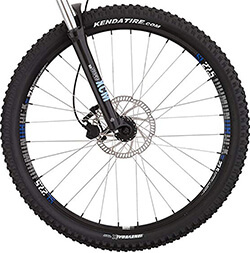 The range of gear options, reliable braking systems, and dual suspension mechanisms are incredible features that you usually can’t find among bikes that are available at this price. Therefore, we highly recommend this bike for newbies who are on a tighter budget. The bike may be a little heavier for some riders. Question: Are there any grips available? Answer: Yes! There are grips made out of silicone materials for added comfort. Question: What’s the rise of the handlebar? Question: Are there any accessories included? Answer: When you purchase this bike, they include an instruction manual and mini toolkit. So, now that you have a better understanding of the features that this bike has to offer, you may be curious about whether there’s anything else you should be aware of. Prior to making a purchase, it’s a good idea to know that the DB Atroz 3 mountain bike is delivered to you in a partly assembled state. Therefore, you should be prepared to spend a little time gathering the remain parts for yourself. Approximately 95% of it is already put together. You only need to assemble a few key parts and make some adjustments. Having said that, we understand that not everyone will feel confident in doing that. In that case, you can just take the bike down to a local bike shop, and they’ll take care of it for you. For the less experienced people, taking it to a bike shop will ensure that all the parts are correctly assembled. 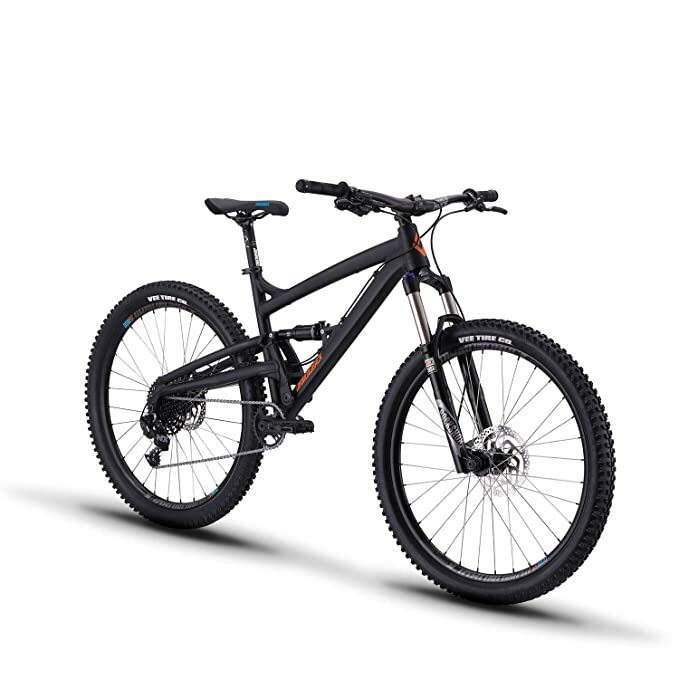 The fact that the Diamondback Atroz 3 is available at such an affordable price is surprising to us. With dual suspension system, gears, reliable brakes, high speeds, and a fantastic design; we’d expect a bike of this caliber to be well above $1,500. But it’s available for under that! All of the information you need to make the best decision is provided above. Be sure to consider it all before committing to a purchase.